How to make chambanga (rose apple) wine at home. 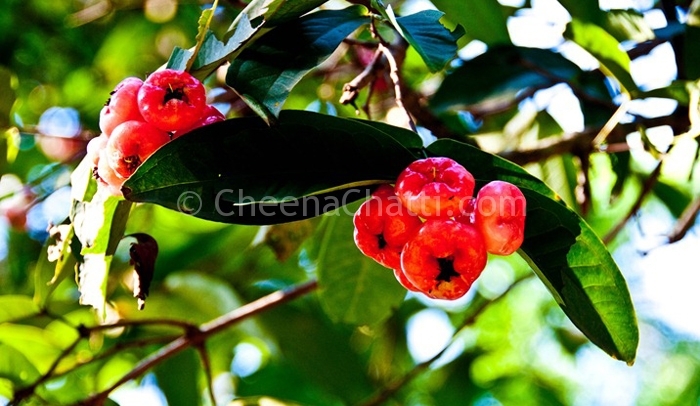 This is the season of rose apples aka chambanga. We have a lot of them in our yard. Last month, seeing a lot of them getting fallen down and wasted, I thought of trying something with it. The first idea that came into my mind was making wine using these rose apples and here is the recipe of the one I made. Clean the chambangas well, remove the seeds and slice it into small pieces. Add sugar, water, yeast and keep it in a wine bottle for 21 days. After 21 days, open it and filter out the clear top liquids. Discard the sediments. Keep the liquid in the same bottle for another 21 days more. On day 42 you will get strong chambanga / rose apple wine. Adding 4 or 5 cloves (grambu) can make it more kicking. This entry was added on April 7th, 2013 by Renoos in Beverages and tagged with rose apple wine, wine recipes, dessert, wine, how to make wine, Chambanga. Last revised on March 30th, 2018. You actually made and tasted this stuff? @Albert De Souza: Here at CheenaChatti we have shared only those recipes which we have tried and tasted by ourselves. You can try it and let me know. Albert De Souza its not technically wine, and please don’t get all judgmental on the lady. The whole reason why alcohol is haram is not because of the alcohol content in the wine. the reasons are more practical than you think sir. John Joy Thanks for trying the recipe John. Hope you prepared it correctly. Keep me updated about the results. Wish you and your loved ones a blessed and happy Easter. Hi friend where shall I keep this wine bottle ? It’s really warming wether outside. Is this need to keep it in cool place ? @Amith, Not sure about this. We usually keep it at room temperature.